If you are a System i application developer using SQL for data access, you may have encountered the need to implement a full outer join. Or perhaps you have implemented full outer joins on another database platform and are porting your application to support DB2 for i5/OS. In either case, a full outer join enables a query to return both matching and non-matching rows from both of the tables specified in the join. This is different from inner joins (which return only the matching rows), left outer joins (which return all rows from the table on the left, with null values for non-matching rows on the right), and right outer joins (which return all rows from the table on the right, with null values for non-matching rows on the left). Full outer joins are less common than the other three, but sometimes you might need this sort of behavior in your application reports. Unfortunately, as of V5R4, DB/2 for i5/OS does not support full outer joins. However, you can simulate this functionality. Management is still not satisfied. Now, they want to include all employees that are not in a valid department (yes, this company has some referential integrity issues). This is where it gets a bit dicey. Since the previous report used a left outer join to include all departments without an employee, adding this additional information to the report would also require a right outer join in the query. The combination of a left outer join and a right outer join in the same query is known as a full outer join, and as mentioned, is a type of join that is not currently supported on DB2 for i5/OS. First, notice the use of the WITH keyword to create common table expressions. If you are unfamiliar with common table expressions, think of them as temporary views that exist only during the query's execution. This recommended approach helps reduce the query's complexity by minimizing the amount of text, especially when referenced multiple times in the query. It also helps explain the steps taking place: FOJ1 and FOJ2 are encapsulations of the full outer join steps. The different segments are color-coded to illustrate how each is mapped. Blue is the first full outer join, red is the second full outer join, and green is the final SELECT statement. The blue full outer join expression is executed first, and the results are referenced by FOJ1, which becomes the left table of the second outer join expression. The results of that expression are referenced as FOJ2 and are used as the table reference in the final SELECT statement. The second thing to note is the use of the AS clause to rename columns. This will eliminate column ambiguity as the resulting columns advance through the expressions. Avoid using SELECT *. Instead, select only those columns that will be used in a subsequent common table expression or by the query. This can improve the performance of the query by minimizing the amount of data that DB2 has to move around. This simulation of a full outer will not be as efficient as a true full outer join that is supported natively by the database. Just be aware that you can proactively address potential performance issues by having a good indexing strategy. This means that you should at least have indexes built over all of the join columns. For more information on indexing considerations, refer to the white paper "Indexing and statistics strategies for DB2 for i5/OS." 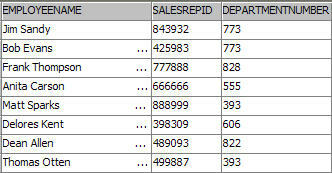 Full outer joins provide a way for your reports to show all matching and non-matching rows in specified tables. And now you know how to simulate them on the System i.
Gene Cobb is a DB2 Technology Specialist on IBM's ISV Enablement team for System i. He has worked on IBM midrange systems since 1988, with 10 years in the IBM Client Technology Center (CTC), IBM Rochester. While in the CTC, he assisted customers with application design and development using RPG, DB2 for i5/OS, CallPath/400, and Lotus Domino. His current responsibilities include providing consulting services to System i developers, with special emphasis on application and database modernization.